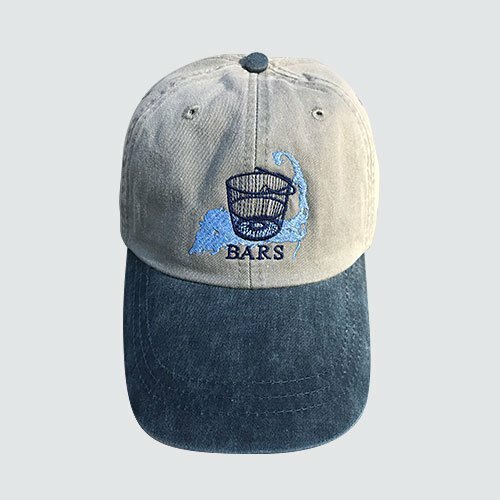 The new classic BARS hat is 100% pigment-dyed, unstructured, 6-panel, water-washed cotton twill with 6-panels. Embroidered eyelets, contrasting pigment-dyed button and visor, antique brass snap with tuck-in closure completes its design. The top is Stone Gray and the brim is Navy. One size fits all. The front of the hat is beautifully embroidered with the BARS acronym, shellfishing basket, and shape of Cape Cod. 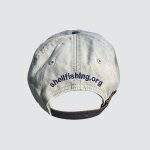 The back of the hat includes the BARS website address, shellfishing.org. These are handsome, long lasting, well made hats. 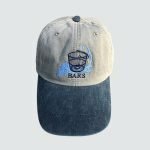 The BARS classic hat also makes a wonderful gift! Price includes shipping. The new BARS logo was designed by longtime BARS member Andrew Newman and beautifully embroidered by Advanced Embroidery in Hyannis, MA.